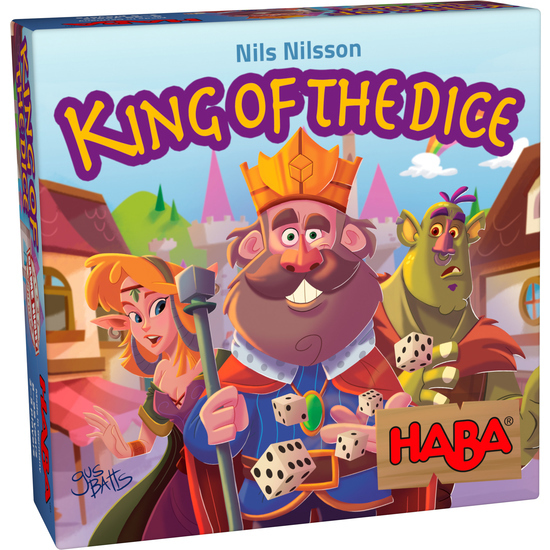 The players want to gain new citizens for their kingdoms by fulfilling the various requirements on the cards with three rolls of the dice. Special cards provide benefits. But watch out for scoundrels and dragons! The player with the best citizens at the end wins the game and makes their kingdom thrive! Contents: 6 dice, 65 game cards (15 village cards, 10 penalty cards and 40 citizen cards), 1 set of instructions. Short game instructions: • Lay out location cards, citizen cards, and penalty cards as described. • Turn over 5 citizen cards and place them below the location cards. Fill up the row of cards (Lay out new citizen cards from the deck). • The game ends when a deck of “citizen cards,” “penalty cards,” or any deck of “location cards” is used up. • Add up victory and minus points. The player who has collected the most victory points wins the game.